Do you believe in angels and fairies? Well, we do. A fairy is a type of mythical being or legendary creature in European folklore, a form of spirit, often described as metaphysical, supernatural or preternatural. Fairies resemble various beings of other mythologies, though even folklore that uses the term fairy offers many definitions. Much of the folklore about fairies revolves around protection from their malice. Although in modern culture they are often depicted as young, sometimes winged, humanoids of small stature, they originally were depicted quite differently: tall, radiant, angelic beings or short, wizened trolls being two of the commonly mentioned forms. One common theme found among the Celtic nations describes a race of diminutive people who had been driven into hiding by invading humans. When considered as beings that a person might actually encounter, fairies were noted for their mischief and malice. 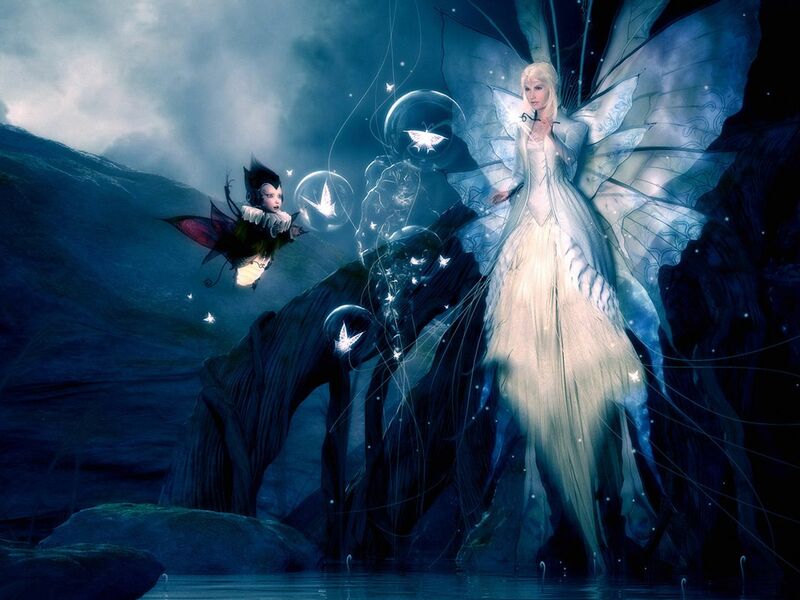 Fairies are generally described as human in appearance and having magical powers. Their origins are less clear in the folklore, being variously dead, or some form of demon, or a species completely independent of humans or angels. Source: Wikipedia. An angel (from the Greek ángelos) is a supernatural being or spirit, often depicted in humanoid form with feathered wings on their backs and halos around their heads, found in various religions and mythologies. The theological study of angels is known as “angelology” . In Zoroastrianism and Abrahamic religions they are often depicted as benevolent celestial beings who act as intermediaries between Heaven and Earth, or as guardian spirits or a guiding influence. The term “angel” has also been expanded to various notions of spirits found in many other religious traditions. Other roles of angels include protecting and guiding human beings, and carrying out God’s tasks. In art, angels are often depicted with bird-like wings on their back, a halo, robes and various forms of glowing light. The word angel in English is a fusion of the Old English/Germanic word engel (with a hard g) and the Old French angele. Both derive from the Latin angelus which in turn is the romanization of the ancient Greek ángelos, “messenger”, “envoy”, which is related to the Greek verb angéllō, meaning “bear a message, announce, bring news of”. Source: Wikipedia. This is our gif collection with the best gifs of fantasy that we were able to find so far. This Gallery it’s finished. More images of fantasy will be added in individual posts. We hope you enjoy and also believe in angels and fairies as we do.